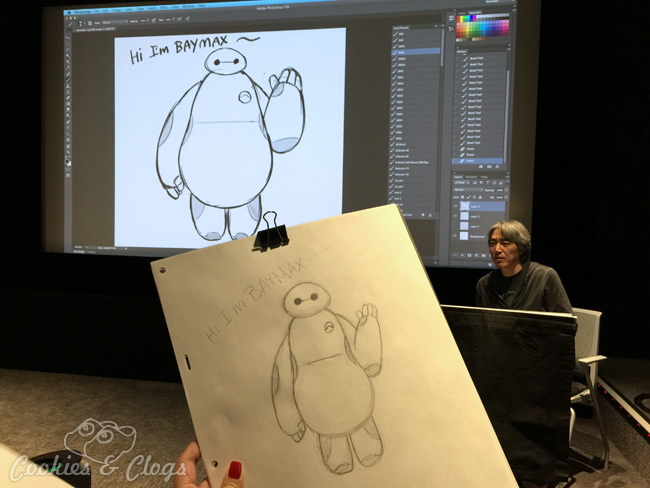 To get the skinny on Big Hero 6 straight from the directors and see how the film was made, a trip to the Walt Disney Animation Studios in Burbank, CA was in order (aka Disney Animation Building). I love how the exterior of the building is always decorated to match the currently featured movie. 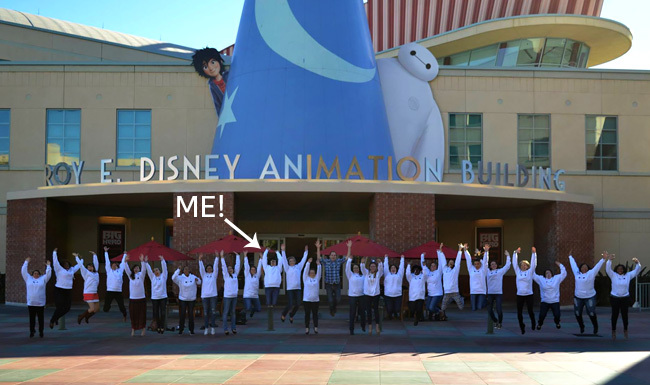 Before we got started on our full Big Hero 6 press day, our group had to take some commemorative photos of the event. The inside was no different as we navigated the halls to each of our activities. 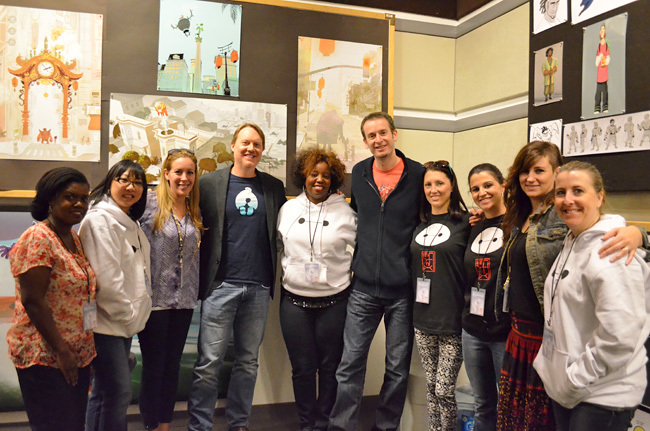 Then it was time to have a group interview with the filmmakers of Big Hero 6 – directors Don Hall & Chris Williams. We chatted for some twenty minutes so I’ll just share some of the highlights with you. Both directors were surprised that John Lassiter chose Big Hero 6 to be the next feature film to work on, especially with many other options on the table. Everyone was really taken with the idea of a kid who was going to lose his brother and who would be left with his brother’s robot, a surrogate big brother, to help him move on. That just struck a chord with everybody. Everything changed once Baymax was made the focal point of the movie. The story didn’t come together until we put Baymax front and center and really took that idea that he wants to heal him and put it in the forefront. Before, he was really reactive to Hiro and he just followed Hiro around. He was always a great character but when you put him front and center and make him proactive, he’s the one engaging a lot. If you look at it, he’s the one that’s really kind of pushing the story forward. He’s the one that brings the friends in and he’s the one that furthers the flight because it’s making Hiro feel good and is helping him forget about the loss of his brother for a little bit. Once we did that, that’s when the story really kind of started. There was another part that was different from the comic. The scene where it’s just the two of them sitting on the wind turbine above the clouds — that really sort of sweet scene — was a very late addition. We realized there was something missing and we added that scene. It really solidified the relationship and we understood then how much they were invested, how much they loved each other. One main rule governed the art direction – simple characters on a complex background. The “world” had to be decided on from the start. How was San Fransokyo decided upon? We knew that no matter what we picked, we were going to integrate a Japanese stamp on it. San Francisco just felt cool because it’s very recognizable. It’s a contained city. It’s a beautiful city. And there’s so many things that people recognize around the world, like the Golden Gate Bridge, cable cars, the topography, and Coit Tower. It just felt like we could make a really grounded, relatable world but still have the fantasy that we do in animation. Also, we knew that there was going to be no superpowers in the movie. Nobody is magic. Nobody is irradiated by any kind of cosmic ray, gamma ray, spiders, or anything. It’s going to be real people and their superpower is going be super technology. Both of those cities, Tokyo and San Francisco, are kind of hubs of technology. So that kind of felt like another kind of easy integration. The team ran some technology ideas past Tom Wagner who worked on I, Robot to keep the robots and gadgets as close to real as possible. We kind of ran, not just the robot stuff, but technology through him. For example, plasma blades. We wanted Wasabi to have plasma blades. Can that happen? And he said, “Well, yes, if you do this, and you did that.” Some of it we’d use and some of it we pulled back just for design reasons. But everything in the movie is researched and grounded because we tried to keep it as real as possible. The directors concluded with the main theme of Big Hero 6. It’s about loss and howyour loved ones can live on through the choices that you make. Ultimately, it focuses on how they can live on through you. Touching, right? Well, I think they did a superb job as Big Hero 6 is visually amazing and rich with emotion! The line between his eyes is slightly below the the center. His body is a pear shape. The darker bits represent a thicker, more durable material for points that would suffer more wear and tear. Baymax has three fingers and a thumb. All lines are curved except for the line between his eyes and on his heart (where the program chip is). Even with all of this, our day at Disney Animation Studios was not done. Stay tuned as posts are still coming about our interview with Jamie Chung (voice of Go Go Tamago) and Genesis Rodriguez (voice of Honey Lemon), my recording booth voice over, and much more! Big Hero 6 is out now so go see it! 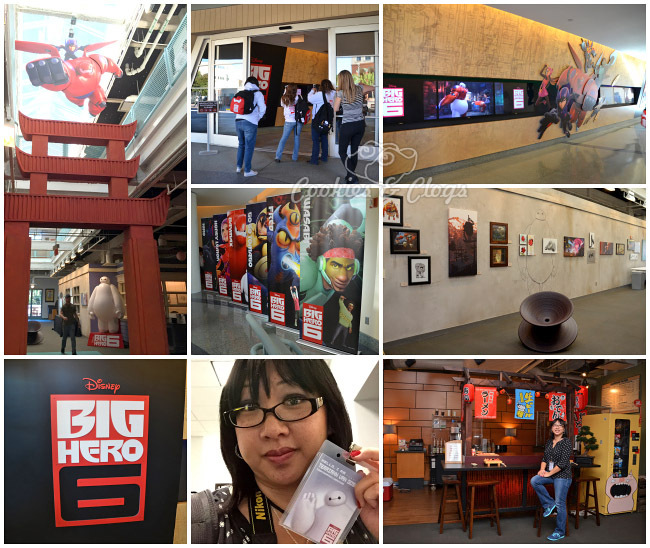 I was invited on an all-expense paid media trip as a guest of Disney and ABC in honor of the Big Hero 6 movie and mentioned sitcom series. All opinions are my own. It sounds like such a wonderful time, what fun and love the group! We saw the movie last Sunday and loved it! It was in the top 2 best family movies I’ve seen all year! And I love those sweatshirts… would love to have one! I agree I love how they change up the building. As an artist myself I love the drawing. What an amazing behind the scenes experience! I have not seen this film yet, but am willing to bet it is that much more wonderful after seeing how it was made.